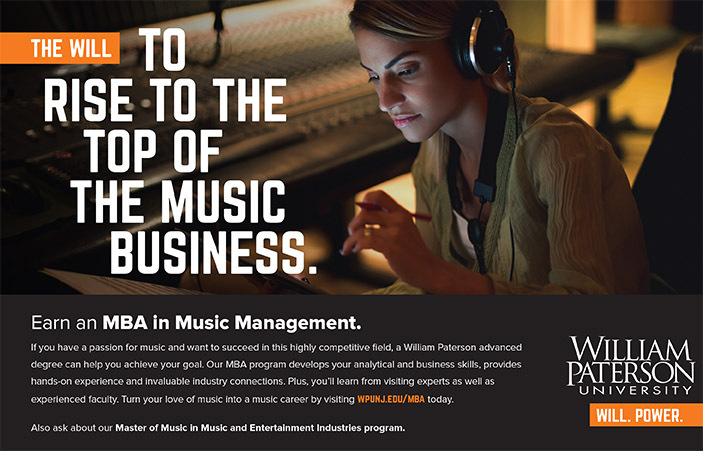 Last week, your William Paterson University music biz professors took a gaggle of students to visit Sony Music Entertainment. Above, you see that gaggle hang around and about RCA Records Co-President (and WPU alum) Joe Ricitelli. Joe spent 45 minutes chatting about the business, about radio, about streaming strategies, and more. He also agreed to come back on the Music Biz 101 & More radio show in the fall. Our next Music Biz 101 & More radio show will be this Wednesday, March 27 and feature John Strohm, President of rounder Records. John used to be in ’90s band The Lemonheads and we’ll talk about the transition from musician to lawyer to label president. We have some other great guests coming up: Glen Barros, COO of the Concord Music Group, and Mike Greene, ADA’s Senior Director of Digital & Marketing Strategy. We’re also talking to some other smart humans who will share their proprietary brain matter with us all before we go all pre-recorded in June. All podcasts are on iTunes, Spotify, and SoundCloud. Just look up Music Biz 101 & More. Your life expectancy will rise by one-third. 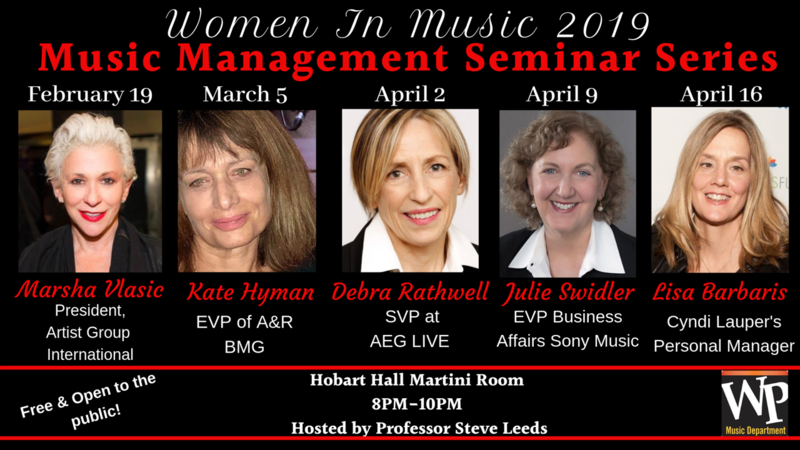 Yes, we’ll be wearing out fancy pants on three consecutive Tuesday nights as part of the 2019 Music Management Seminar Series. Which one of these top females in the biz are you most looking forward to? Hit reply and give us an ounce of feedback. 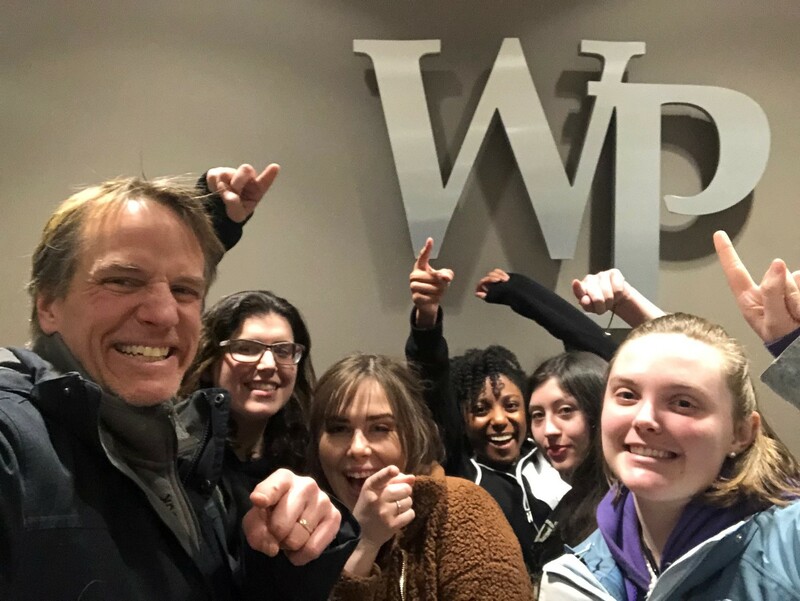 That’s your pal, Professor David Kirk Philp (on the left) flanked by the executive board of the WPU Music & Entertainment Organization: Bianca Russo, Gina Wille-Rajekas, Taylor Turner, Jayde Onori, and Gwynne Stevenson. Philp clearly has the best hair. That’s Dream Hotel Group’s Rohit Anand on your left, breathing the same air as your Professor David Kirk Philp. Rohit just got married, so wish him a happy 50 years of bliss. We all need some external inspiration now and again. So rather than write out a thousand words about the topic, here are a handful of links, videos, and podcasts that might jolt you better than that fourth cup of coffee. Fast Company: The World’s 50 Most Innovative Companies – Worth clicking and scrolling. Some companies you’ve heard of, most not. That’s good. Your brain needs new knowledge, not to sit back on what it already knows. LinkedIn Marketing in 15 Minutes A Day – You probably don’t use LinkedIn enough. For the music biz, it’s vital that you not only have a presence there, but that you keep your profile updated and you regularly interact there. Here’s the lobby of the Dream Hotel Downtown. Beautiful and bright, those aren’t lights up above. What you see are windows to a swimming pool. 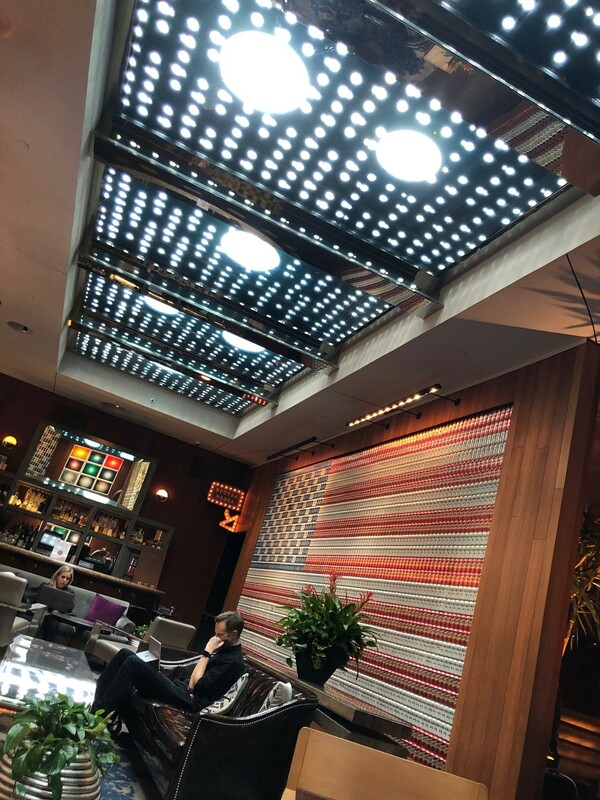 The reflection of the sunlight on the water and glass makes the lobby’s American flag shimmer. 11 Proven Band Merch Ideas To Create Excitement, Sales, and Fan Loyalty – There are some great ideas here that you probably haven’t tried. This is one of the best articles about DIY merch that I’ve seen.Tony Robbins – How To Break Your Negative Thinking – Deep breaths, better posture, and focusing on the good, not the bad (or the, “what if I fail?” crap). Watch this short video and give it a try. Don’t be shy. Just make the effort. The Art of Asking – Amanda Palmer was the first artist to raise over $1 million on Kickstarter. Watch this video about how she did it. Most important, she learned how to ask. And how to say thank you. 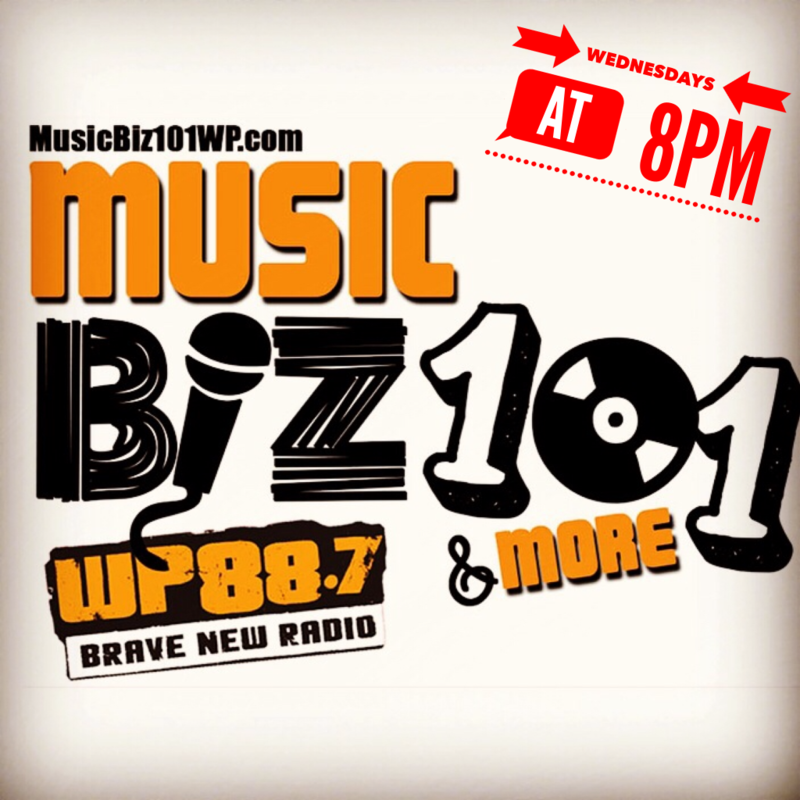 Meanwhile, did you know – Over 200 Music Biz 101 & More Podcasts Are Up?